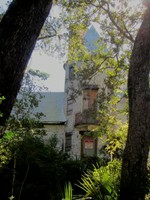 The round, pointed tower of the derelict old mansion atop Mount Cornelia is vaguely reminiscent of “Collinwood” of Dark Shadows fame. But unlike Collinwood, which had a few semi-normal living inhabitants in addition to its ghosts, vampires, werewolves and witches, whatever supernatural entities stalk Fort George Island’s “castle” in northeastern Florida have only each other for company. Over the next two years, everything was handled by mail and a spectacular Tudor Revival dwelling with half-timbering on the upper level and a round tower with conical roof slowly arose amid the scrub oaks and thick underbrush of the island. Two of the home’s most outstanding features were a semi-circular wrought iron balcony above the front entrance and massive central chimney. Following completion of the structure in 1930, huge cartons of heavy mahogany, walnut and oak furniture began to arrive to furnish the Neff family’s winter home. Tragically, the fine items remained unpacked for on April 7, 1931, Nettleton Neff locked himself in Room 508 of the Railway Exchange Building (now the Sante Fe Building) at 224 South Michigan Avenue in Chicago, and shot himself in the right temple with a .45 caliber revolver. He was 50-years-old. According to his youngest daughter, Louise Neff Collins, even though the family had suffered two recent losses, her father’s suicide was unexpected. The first loss occurred August 17, 1926, when Neff’s wife, Kathleen, age 44, died in a mysterious fire at the family’s summer cottage on Lake Michigan. A carpenter working in the garage heard an explosion and a woman’s scream and attempted to drag Mrs. Neff to safety, but she was too heavy and perished in the blaze that quickly reduced the dwelling to ashes. Two of the Neff children, Richard, 18, and Louise, 11, were at the beach not far from the house at the time of the incident. Neff and the couple’s two other children, Wayne, 19, and Barbara 17, were traveling in Europe. Two years later, in June 1928, Neff’s son, Wayne Neff, 21, a junior at Harvard, disappeared. His body was found two weeks later hanging in an apple tree in a secluded spot 10 miles from Stonington, Conn. The young man’s shirt was twisted into a “rope” and attached to his belt, which was around his neck. Presumably, he had taken his own life, though neither family nor friends could find a motive. When Mr. Neff returned to Chicago, a letter, mailed on the day Wayne’s body was discovered, was waiting for him. It contained a ransom note demanding $50,000. A few days later, he received a second letter in which the writer claimed Neff’s failure to pay the ransom had resulted in his son’s death. For several years, the newly-constructed residence at 11435 Fort George Road stood vacant. Nearby neighbors reported what one described as “booming organ music” emanating from the uninhabited house in the middle of the night. Rumor had it Mrs. Neff was an accomplished organist and a German craftsman had been commissioned to construct a magnificent pipe organ for her Florida property. In truth, the edifice contained no such instrument and, of course, by the time Neff commissioned the building of the house, his wife was dead. People also noticed that fog seemed to swirl around the deserted building where it remained even after the sun had dissipated the mist everywhere else. Others were spooked by unexplained flickering lights in the vicinity of the house and nearby boat basin. The unexplained lights, sometimes called “corpse candles” or “fairy lights,” have been observed by many. The Timuquan Indians who once populated the island believed such lights were the spirits of the dead. Most people in modern times dismiss strange illuminations as nothing more than foxfire or swamp gas, but there are those on Fort George Island who are convinced the mysterious flickers of light are somehow connected to the old house on the hill. For undisclosed reasons, the Merrills abruptly abandoned their winter abode in the 1960s and, again, the house stood vacant. It wasn’t long before the stillness of the night was once again broken by the eerie strains of a spectral organ. The Sphere from Outer Space. The family had lived in their unusual home almost five years when one dry spring day, a brush fire burned through much of the Betz’s woodland property. On the afternoon of March 27, 1974, Mr. and Mrs. Betz and their son Terry (above), a 21-year-old medical student, were inspecting the damage. As Terry walked through an patch that had somehow been missed by the flames, he came across a metal, bowling ball-sized spherical object and despite the recent fire, it wasn’t even warm to the touch. Initially, they all thought it was possibly an old cannonball and took it into the house, where they discovered there was an odd triangle etched into the orb and it weighed 22 pounds. A few weeks later, Terry was strumming his guitar in the room where the sphere had been placed and the object began emitting a “throbbing” noise, which so disturbed their small dog that it howled as though the sound was hurting its ears. Now thoroughly puzzled, Terry and other family members sat on the floor and attempted to roll the ball to each other, but instead of continuing in the direction it was sent, the thing would stop and roll back to the person who had pushed it. Someone suggested the mysterious sphere may have fallen from a NASA spacecraft launched at Cape Canaveral, which was just 160 miles south of Jacksonville. Terry proceeded to conduct a series of experiments and discovered when struck with a hammer, the object emitted a loud ring and when shaken, it rolled all around the room of it own accord. Once publicized, interest in the sphere spread far and wide and it wasn’t long before NASA, the military and the Arial Phenomena Research Organization began contacting the family. When military officials requested permission to take the object for further tests, Mr. and Mrs. Betz refused. However, while the sphere was within the house, family members reported all sorts of paranormal phenomena, including, but not limited to, slamming doors and what could be described as loud organ music in the middle of the night. Whether this incidents were caused by the mysterious object, or the resident ghosts, no one knows. Of course, there came a day when government officials seized the sphere and transported it to Naval Air Station Jacksonville for study. When x-rays were attempted, it was discovered the electromagnet rays weren’t of sufficient strength to penetrate the core. It was also determined the object was comprised of corrosive-resistant magnetic stainless steel that could withstand high heat and an incredible 120,000 pounds of pressure per square inch. 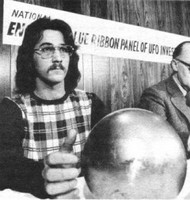 Some have hypothesized that what has come to be known as the Betz Sphere was the navigation device of an extraterrestrial craft that crashed on Fort George Island in March 1974 and started the brush fire. In 1985, the Betz family sold their somewhat weird home to Fairfield Communities and it was utilized as housing during archaeological projects. Four years later, in 1989, the Florida Park Service purchased the property and maintained offices in the building for some of its employees, who often reported inexplicable occurrences. The structure was sold again in the early 1990s as part of what was to be a massive Fort George Island development project. But the plan fell through when citizens objected to the destruction of what was a wildlife sanctuary, as well as an area of historical significance. Fortunately, the State of Florida agreed, purchased the property and now most of the island, including the castle, is owned by the state. Until the late 1990s, parts of the Neff House were utilized as state offices, but even the most stalwart of civil servants were reluctant to remain in the spooky old building alone. In 2002, the wing to the right of the tower was removed, leaving the once magnificent edifice looking as though a portion of it had been literally sliced off (above). Today, the castle is once again deserted and quickly deteriorating. The only visitors willing to brave the overgrown road winding through a canopy of neglected trees to reach the derelict dwelling seem to be local ghost-hunters and thrill-seekers. Though few take the claims of such people seriously, reputable individuals still report seeing flickering lights and occasionally, someone swears he (or she) hears a haunting melody, played by unseen hands on a phantom organ, emanating from the direction of the old Neff House. Sources: Geri Betz interview (1997); Vera Chapman (1997); Louise Neff Collins interview (1998); Sandy Stricklen, The Jacksonville Journal; The Jacksonville Historical Society; U.S. Navy; The State of Florida; The Florida Times-Union; The New York Times, June 18, 1928; and The Palm Beach Post, April 1974. *Neff was from Chicago, not St. Louis. Very interesting. Did they ever find out what the sphere was? I read about the sphere back in the 70's. Then when I moved to Florida, I was surprised when I found out that Fort George Island was near where I lived. There have been rumors that the ball was something used at a paper mill, but I don't think that was ever confirmed. I've also read some stories that the sphere was the cause of the hauntings at the old house, but the hauntings go back to the 30's and the sphere wasn't found until the 70's. It's a shame that the state isn't preserving the old Neff House. At one time, there was talk that it might be turned into a B&B, but after the state took over, it's just been deteriorating. The reason people built winter homes on Fort George Island was because of the mosquitoes. Even now at times there are so many mosquitoes in places that you can't even get out of the car, but they all die off after the first frost. Back in the 1990's, we went down to Fort George Island to see this house. I'm not sure who owned it then, but there were no trespassing signs and when we tried to open the door, an alarm went off.